Following the success of the Bodging Project in 2010, a group of us were looking around for other traditional crafts to try our hand at. 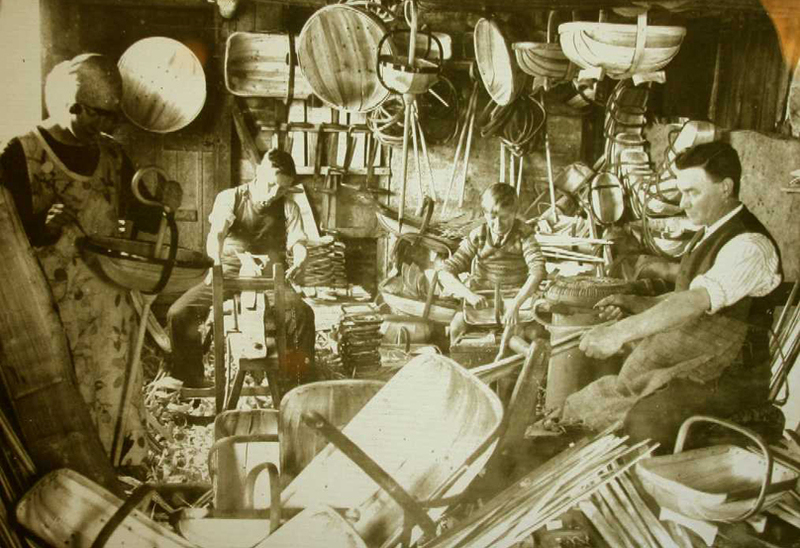 William Warren, who is originally from Sussex, suggested the humble Sussex Trug, and had discovered a number of craftspeople who are quietly 'trugging'. 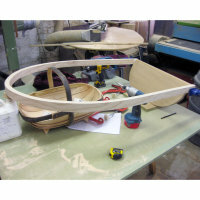 So we (that is William Warren, Gareth Neal, Carl Clerkin, and myself) went down to Hastings to spend a day with John Carnell in his trug workshop. From John we learnt about the history, the materials, and the process of trug-making, and were able to have a go ourselves. The design of the garden trug seems to have hardly changed since Tudor times. Popularity was maintained in the 19th century when Queen Victoria purchased one at the Great Exhibition. 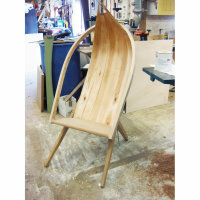 The frames and handles are made from coppiced sweet chestnut (easy for bending), and the body from white willow - the left-overs of the willow used for making cricket bats - shaped with a draw-knife. 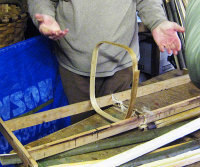 A piece of willow, marked by John on its section, showed which parts of the timber are used for which parts of the trug. The willow is fixed to the frame with copper nails to prevent rust. 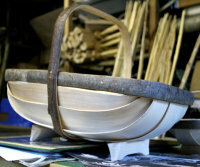 No-one could deny that a finished trug is an object of very great beauty! We went back to our studios and this is where the misunderstanding occurred. 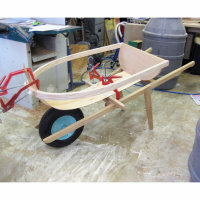 Our idea was to use trug-technology and trug-thinking to come up with something new; John's idea was just to make trugs. 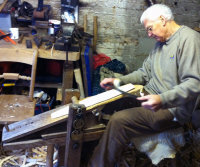 He was charming, but he couldn't be persuaded to help us make anything other than Sussex trugs! Subsequently, with other craftspeople, we realised that this can be the case; they often want to carry on doing what they have always done. In fact this continuity is often part of the appeal of craft, it's the continuation of tradition in the face of change. Meanwhile, with the addition of fellow-designer Simon Maidment, we had each designed a trug-related product. Mine was a version of my wheelbarrow-seat (see 'wheelbarrow' in the garden section of this site). William then discovered another trug-maker. I won't say who he was, as he turned out to be a real time-waster. We had a couple of meetings and then we all went back with prototypes of our designs. Simon had made a very beautiful bucket-shaped trug with a lid, designed as a work-basket. The others also had inventive new ideas. I made a cardboard model of my trug-barrow. All our designs were approved! Back at the workshop I started making my piece (see above) but was having trouble bending the willow. Our new maker said - oh send the frame down and we'll fit the willow. A year later he returned it, unopened, still in the original wrapping. The same result, or lack of result, went for all five of our designs. Maybe we were just a bit ahead of the game? At Chelsea Flower Show in 2016 there were so many trugs that Country Life wrote an article on 'the great trug revival'. 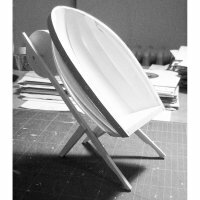 But the lesson to be learned, I feel, is of the difference between craft and design.